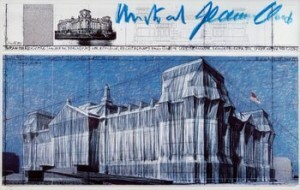 Javacheff (Javacev) Christo has become known for \"wrapping\" famous buildings and geographical landmarks with plastic and woven-fabric sheets. 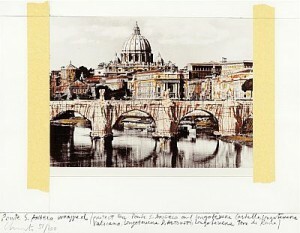 His projects, usually with the assistance of his wife and dealer Jeanne-Claude. 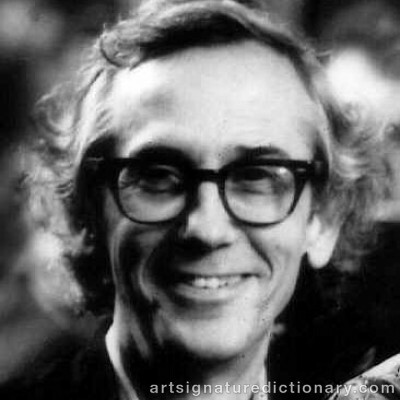 Christo: American, Bulgarian-born Christo Vladimirov Javacheff, June 13, 1935, Gabrovo, of a Bulgarian industrialist family. Jeanne-Claude: American, French-born Jeanne-Claude Marie Denat, June 13, 1935, Casablanca, of a French military family, educated in France and Switzerland. 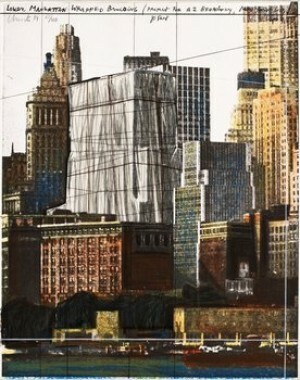 Died November 18, 2009, New York City. Jeanne-Claude: Baccalauréat in Latin and Philosophy, University of Tunis. 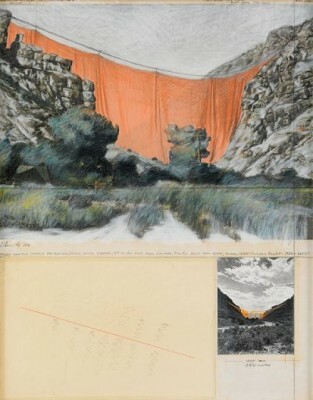 Christo: Studies at Fine Arts Academy, Sofia, Bulgaria. 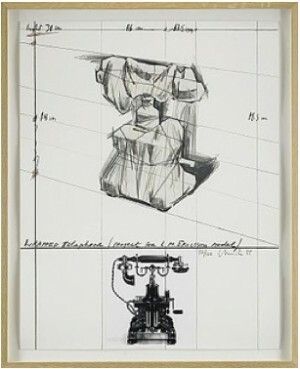 Christo: Studies one semester at Fine Arts Academy, Vienna, Austria. 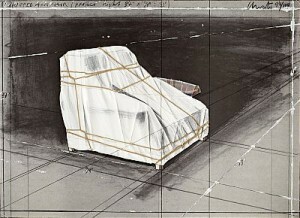 Christo arrives in Paris where he meets Jeanne-Claude. Birth of their son, Cyril, May 11. Project for a Wrapped Public Building. Stacked Oil Barrels and Dockside Packages, Cologne Harbor, 1961. Rolls of paper, oil barrels, tarpaulin and rope. Duration: two weeks. 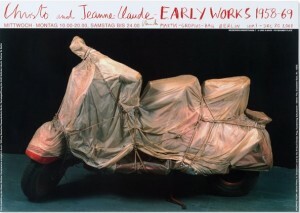 Christo and Jeanne-Claude's first collaboration. 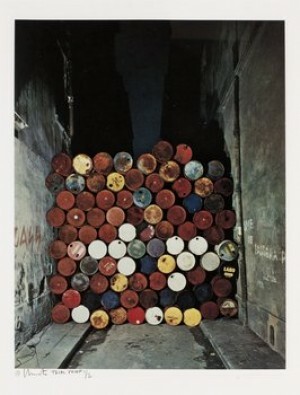 Wall of Oil Barrels – The Iron Curtain, Rue Visconti, Paris, 1961-62. 89 barrels. Height: 13.7 feet (4.2 meters). Width: 13.2 feet (4 meters). Depth: 2.7 feet (0.5 meters). Duration: eight hours. Stacked Oil Barrels, Gentilly, near Paris, France. Store Fronts and Show Windows. 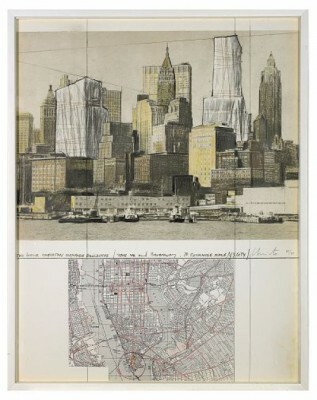 Establishment of permanent residence in New York City. Air Package, Van Abbemuseum, Eindhoven, The Netherlands, 1966. Rubberized canvas balloon, polyethylene, rope and steel cables. Diameter: 17 feet (5.2 meters). Duration: one month. 42,390 Cubic Feet Package, Minneapolis, Minnesota, 1966. Length: 60 feet (18.3 meters). Diameter: 25 feet ( 7.6 meters). Height: 32 feet (9.8 meters). Polyethylene: 8,000 square feet (740 square meters). Manila rope: 3,000 feet (914 meters). Duration: two days. 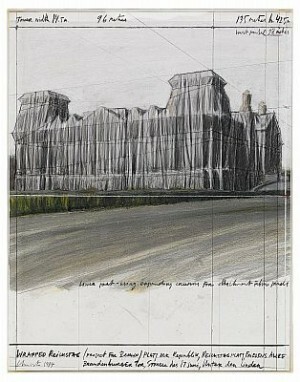 Wrapped Fountain and Wrapped Medieval Tower, Spoleto, Italy, 1968. Polyethylene and rope. Duration: three weeks. Wrapped Kunsthalle, Bern, 1967-68. Polyethylene: 16,156 square feet (2,430 square meters). Nylon rope: 1.9 miles (3 kilometers). Duration: one week. 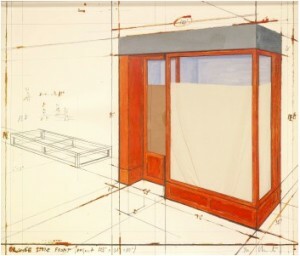 5,600 Cubicmeter Package, documenta IV, Kassel, 1967-68. Height: 280 feet (85 meters). Six concrete foundations arranged in a 920 feet (280 meters) diameter circle. Fabric: 21,528 square feet (2,000 square meters). Rope: 11,482 feet (3,500 meters). Weight: 7 tons. Duration: two and a half months. Corridor Store Front. Total area: 1,450 square feet (135 square meters). 1,240 Oil Barrels Mastaba and Wrapped Hay, Institute of Contemporary Art, Philadelphia, Pennsylvania. Wrapped Museum of Contemporary Art, Chicago, 1968-69. Tarpaulin: 10,000 square feet (930 square meters). Manila rope: 4,000 feet (1,219 meters). Duration: one and a half months. Wrapped Floor and Stairway, Museum of Contemporary Art, Chicago. House painter’s cotton drop cloths: 2,800 square feet (260 square meters). Duration: one and a half months. 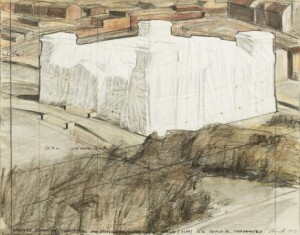 Wrapped Coast, One Million Square Feet, Little Bay, Sydney, Australia, 1968-69. Erosion Control fabric: 1,000,000 square feet (92,900 square meters). Rope: 35 miles (56.3 kilometers). Length: 1.5 miles (2.4 kilometers). Height: 85 feet (26 meters). Duration: two months. 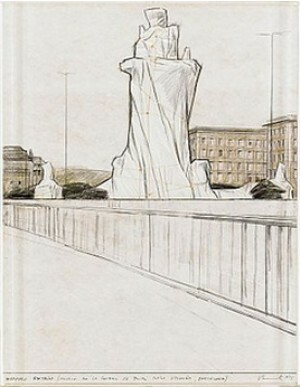 Wrapped Monuments, Milano, Italy, 1970: Wrapped Monument to Vittorio Emanuele II, Piazza del Duomo. Polyethylene and rope. Duration: one day. Wrapped Monument to Leonardo da Vinci, Piazza della Scala. Polyethylene and rope. Duration: two days. Wrapped Floor, Wrapped Stairs, Covered Windows and Wrapped Walk Ways, Museum Haus Lange, Krefeld, Germany, 1971. House painter's cotton drop cloths and brown wrapping paper. Duration: 50 days. 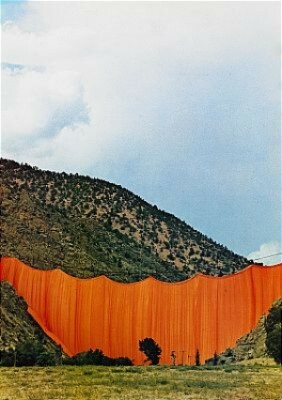 Valley Curtain, Rifle, Colorado, 1970-72. Width: 1,250 feet (381 meters) and a height curving from 365 feet (111 meters) at each end to 182 feet (55.5 meters) at the center. Nylon polyamide fabric: 200,200 square feet (18,600 square meters). Steel cables: 61 tons. Concrete: 864 tons. Duration: 28 hours. 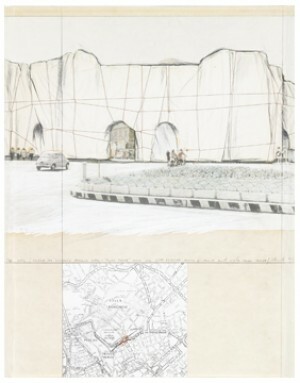 The Wall – Wrapped Roman Wall, Via Veneto and Villa Borghese, Rome, Italy, 1973-74. Woven polypropylene fabric and Dacron rope. Height: 49 feet (15 meters). Length: 820 feet (250 meters). Depth: varying between 13 to 18 feet (4.3 to 5.5 meters). Duration: 40 days. Ocean Front, Newport, Rhode Island, 1974. Width: 420 feet (128 meters), Length: 320 feet (97.5 meters). Polypropylene fabric: 150,000 square feet (13,935 square meters) floating over the ocean. Duration: 8 days. Running Fence, Sonoma and Marin Counties, California, 1972-76. 18 feet (5.5 meters) high, 24.5 miles (39.4 kilometers) long, crossing 14 roads. 2,050 fabric panels: 2,152,780 square feet (200,000 square meters) of woven nylon fabric. 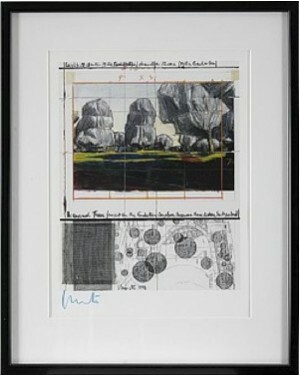 90 miles (145 kilometers) of steel cables. 2,050 steel poles, each: 3.5 inch (8.9 cm) in diameter, 21 feet (6.4 meters) high. Duration: 14 days. 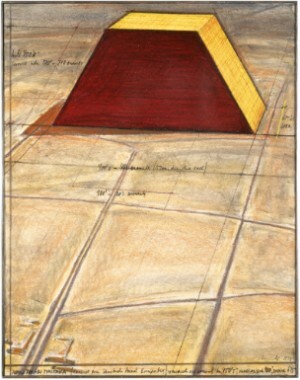 The Mastaba, Project for the United Arab Emirates. In progress. 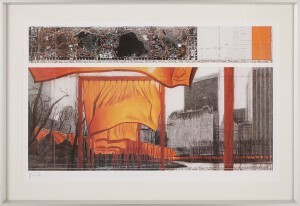 Wrapped Walk Ways, Jacob Loose Park, Kansas City, Missouri, 1977-78. Woven nylon fabric: 135,000 square feet (12,540 square meters) over 2.7 miles (4.4 kilometers) of walkways. Duration: 14 days. 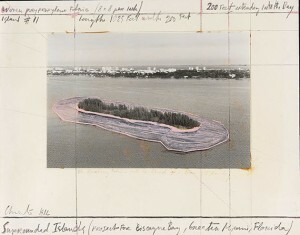 Surrounded Islands, Biscayne Bay, Greater Miami, Florida, 1980-83. Pink woven polypropylene fabric: 6.5 million square feet (603,870 square meters) floating around eleven islands. Duration: 14 days. Wrapped Floors and Stairways and Covered Windows, Architekturmuseum, Basel, Switzerland. House painter’s cotton drop cloths and brown wrapping paper. Duration: 17 days. 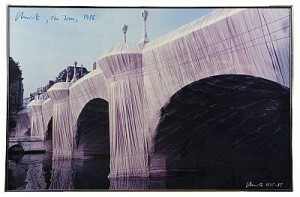 The Pont Neuf Wrapped, Paris, 1975-85. Woven polyamide fabric: 454,178 square feet (40,876 square meters). Rope: 8 miles (13 kilometers). Duration: 14 days. 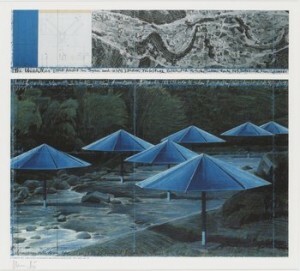 The Umbrellas, Japan-USA, 1984-91. 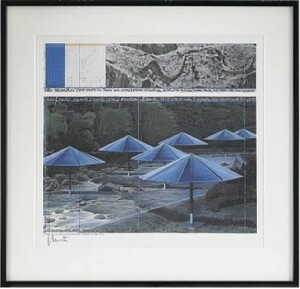 1,340 blue umbrellas in Ibaraki, Japan. 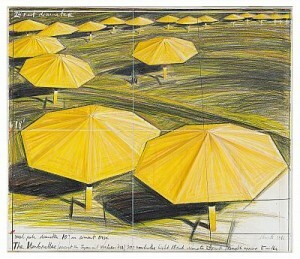 1,760 yellow umbrellas in California, USA. 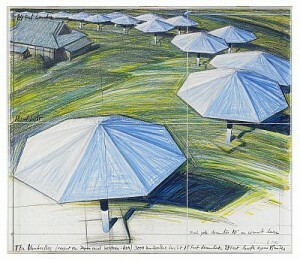 Each umbrella: Height: 19 ⅔ feet (6 meters). Diameter: 28 ½ feet (8 ⅔ meters). Valley size in Japan: Length: 11.8 miles (19 kilometers). Width: 2.5 miles (4 kilometers). Valley size in USA: Length: 18 miles (29 kilometers). Width: 2.5 miles (4 kilometers). Duration: 18 days. Over The River, Project for the Arkansas River, State of Colorado. In progress. Wrapped Floors and Stairways and Covered Windows, Museum Würth, Künzelsau, Germany. House painter’s cotton drop cloths and brown wrapping paper. Duration: three months. 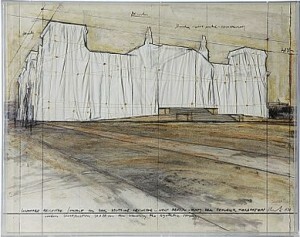 Wrapped Reichstag, Berlin, 1971-95. Polypropylene fabric with aluminum surface: 1,076,390 square feet (100,000 square meters). Rope: 9.7 miles (15.6 kilometers). Duration: 14 days. 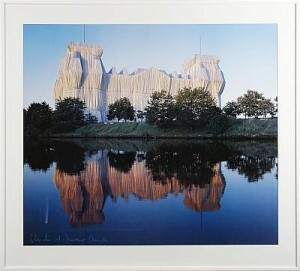 Wrapped Trees, Fondation Beyeler and Berower Park, Riehen, Switzerland, 1997-98. 178 trees. Woven polyester fabric: 592,015 square feet (55,000 square meters). Rope: 14.3 miles (23 kilometers). Duration: 23 days. 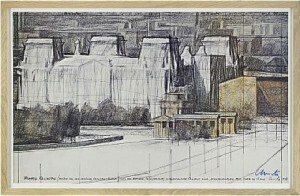 The Wall – 13,000 Oil Barrels, Gasometer, Oberhausen, Germany, 1998-99. Height: 85 feet (26 meters). Width: 223 feet (68 meters). Depth: 23.7 feet (7.23 meters). Duration: six months. The Gates, Central Park, New York City, 1979-2005. 7,503 vinyl gates, with free-flowing nylon fabric panels, anchored to 15,006 steel bases on 23 miles (37 kilometers) of walkways. Duration: 16 days.